Out-of-Site, Out-of-Mind – Leaks from Buried Concrete Structures – Redlog Environmental Ltd. In my last blog post I discussed the issue of vapor instruction into buildings from subsurface sources, namely contaminated underlying soils and groundwater. 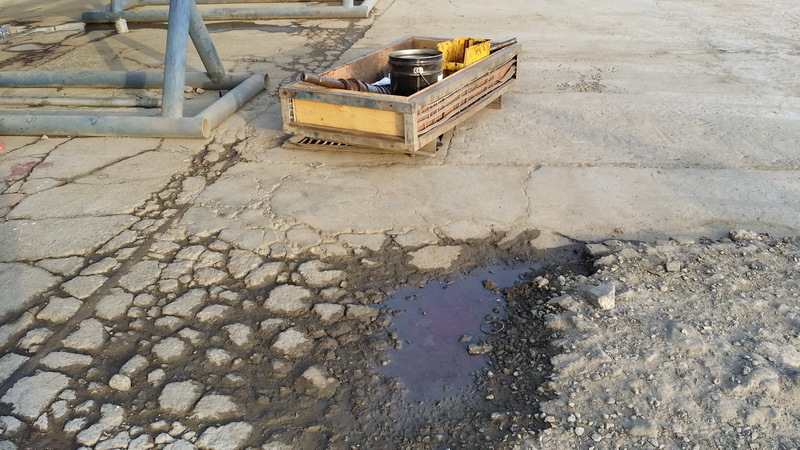 In the article, I want to go into a bit more detail on one of the more common sources of site soil and groundwater contamination – that of leaks from underground structures such as underground storage tanks (USTs), buried drains/pipes, manholes/handholes, sumps, etc. The issue of UST and subsurface contamination is very well documented and well known. There are programs in many countries to replace old USTs, particularly those that were constructed of steel and have now corroded allowing fuel to leak into the ground. If your facility has an older UST containing fuel (or other contaminant source), then be aware that you almost certainly have a problem now or will have one at some point in the future. There are a lot of good resources to help you understand this problem, e.g., USEPA, and there may be specific programs in your country of operation. I encourage you to read and educate yourself on this important topic as there can be serious liabilities for your company and serious health risks to your workers and inhabitants of nearby properties. While the UST issue is reasonably well known, in my experience arguably a more common issue, at least for many oil and gas service and industrial facilities, is soil and groundwater contamination issue associated with equipment washing/cleaning operations. A typical facility will have an area for equipment cleaning, where high pressure steam cleaning, solvents and scrubbing are used to clean equipment returned from the field. These washing ares can be outside or in a wash bay, most commonly on a concrete slab with drains to a nearby sump. The simplest designs are simply concrete holding tanks that are pumped on an as-needed basis. Others may or include oil/water separators, sedimentation tank, water recycling facilities, etc. Regardless of the type, a well-designed and well-maintained washwater system can perform well for many years. Unfortunately, many of the sites I have visited have old systems that have deteriorated over time. And often there has been no attempt at maintenance or understanding of the potential severity of the situation, resulting in serious soil and groundwater contamination issues. This is not because site personnel do not care, rather it is an issue of “out-of-site, out-of-mind”. These are buried structures and leaks are not visible and the consequence (vapor intrusion) is not easily noticeable until (or after) there is a serious problem). Of course, even if there is a crack there is not necessarily a serious issue. This depends on many other factors, such as the type, amount and concentration of contaminants present in the washwater (e.g., hydrocarbons, metals, PAHs, etc. ), underlying soil and groundwater conditions, etc as described in the earlier blog post. If you suspect you have a potential issue with leaks, then I suggest that re-read the last blog post for ideas on the next steps to take to manage this issue. If you have a site with a concrete pad like the one shown above, then imagine what the buried concrete drains and sump are like! concrete formulation – water-cement ratio, aggregate types, additives, etc. environmental conditions – settlement, earthquakes, temperature, surface loading, vibration, groundwater, etc. washwater conditions – sulphates, chlorides, acids, etc. Simply put, the longer the concrete structure has been in place, the higher the likelihood of leakage through cracks caused by one or more of these factors. And, as always feel free to contact us if you need help with assessing this issue at your site. We will most certainly be pleased to help. Please enter your email in the box at the top of the post and subscribe to our blog HSE Asia – our weekly blog will be emailed directly to you. Photo Credits: Cracked concrete image from Redlog Environmental Ltd.
Posted in Environment, HSE, Occupational Health, Worker Safety and tagged air quality, vapor intrusion, VOC, volatile organic compounds.